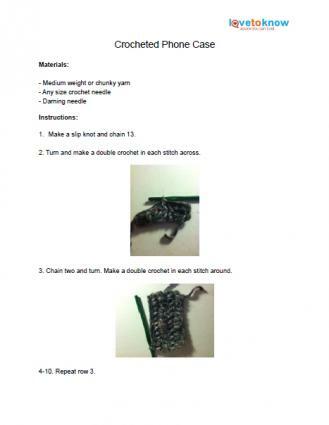 While you can purchase a number of phone cases from retail outlets, making a handmade crocheted phone case is a unique and easy way to protect your phone. A crochet phone case also makes a wonderful gift. 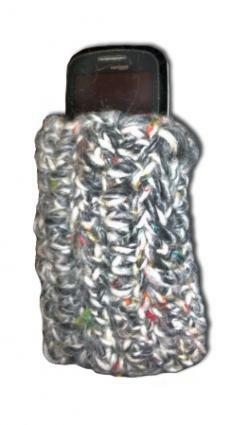 This cell phone case is easy enough for the novice crocheter to make and is a great way to use up old yarn. If you have mastered the half-double crochet stitch, you can make this case in a snap. To download the pattern, click on the image or its caption to open the .pdf file in a new window or tab. Then you can either save the pattern for later use or print it out immediately. This case is easy to personalize by adding accessories and embellishments. For example, you can stitch a few more rows for a fold over flap that can be closed using a button or snap closure. You could also decorate the case by sewing on motifs such as crocheted flowers, or embroidery designs. A drawstring is a simple way to close the case. Work in rounds, joining each round with a slip stitch. Make two chain stitches and double crochet in each stitch around. Join with a slip stitch. Make two chain stitches. Double crochet in the first stitch, chain one, skip the next stitch and double crochet in the next. Repeat all the way around to create a lace look with chain spaces. Join the end of the round with a slip stitch and tie off. Weave the drawstring in and out through the open end of the case. Pull both ends tight and tie in a bow to close the case. Give your case a little more personality with colorful stripes. Following the main pattern, tie off yarn after two rows and tie a new color yarn on. Continue the pattern for two more rows then switch colors again. Change every other row for thinner stripes and every three rows for wider ones. A strap is another way to create a closure for the case. Make a slip stitch and chain nine. Turn and make a single crochet in the second chain from the hook and each stitch across. Eight stitches total. Chain one, turn, make a single crochet in each stitch around. Eight stitches total. Repeat and tie off yarn. Sew one end of the strap to the center back of the case. Sew Velcro to the center front of the case, and to the other end of the strap to secure the case. The nice thing about a crochet case for your phone is that it can fit around whatever case you already have, adding more protection and a great look. Because they use so little yarn, these cases make great and inexpensive gifts for any occasion.